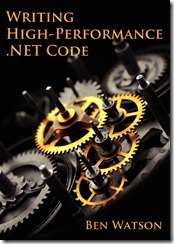 Head on over to http://www.writinghighperf.net to read a sample chapter of Writing High-Performance .NET Code, 2nd Edition. The sample PDF also includes some of the front and back material to give you a taste for the rest of the book. This entry was posted in Uncategorized on May 23, 2018 by Ben.